Good ambience, massive dining hall, traditional full service restaurant with some good Hyderabadi Biryani, kababs & traditional desserts. Meal for 2: Rs. 300 onwards. Over many years I have been hearing about Paradise – A paradise where the Biryani makes u feel like u r in Paradise. Well, it did not really turn in that way but the biryani was good. It was a big task for me as a tourist to find out the real Old Paradise from amongst the numerous namesakes n different parts of the city. 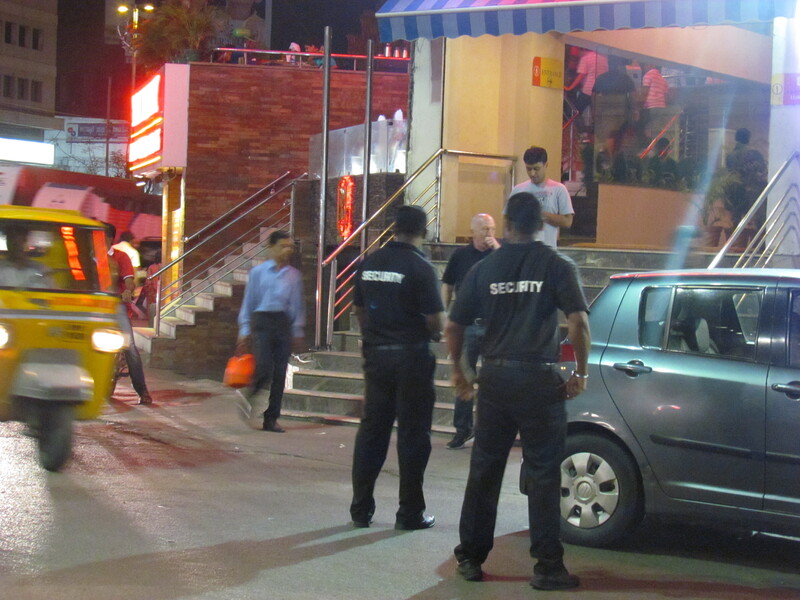 The experience of dining at Paradise started when we saw two bouncers at the gate on ground floor – Bouncers in Biryani shop to manage crowds!!!! The checking post that was almost airport style – xray, frisking etc … to enter the building. 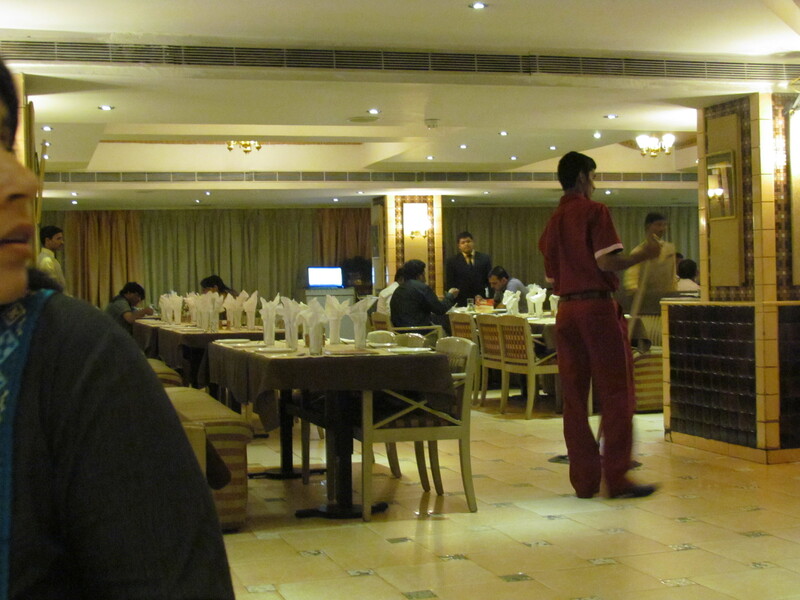 The restaurant has a huge L shaped dining Hall with traditional wooden furniture – not opulent, not very basic. The service style is traditional 80s. Suited Hosts come to the table to greet & discuss orders. I say ‘discuss’ coz here they do not just ‘take orders’ , they suggest, discuss & finally the order is written down. I was amazed the way the gentleman told us to cancel some dishes coz he thought that wud be over ordering leading to wastage of food / packing. Also, the way he was talking was ‘as an expert’ rather than a typical ‘customer – seller’ way. Wow, loved the gesture of guiding us. Service guys were quite warm & were surely well trained. Paradise being famous, I cud see big groups of expats in tables all around. The menu card is colorful , easy to read & it surprised me. 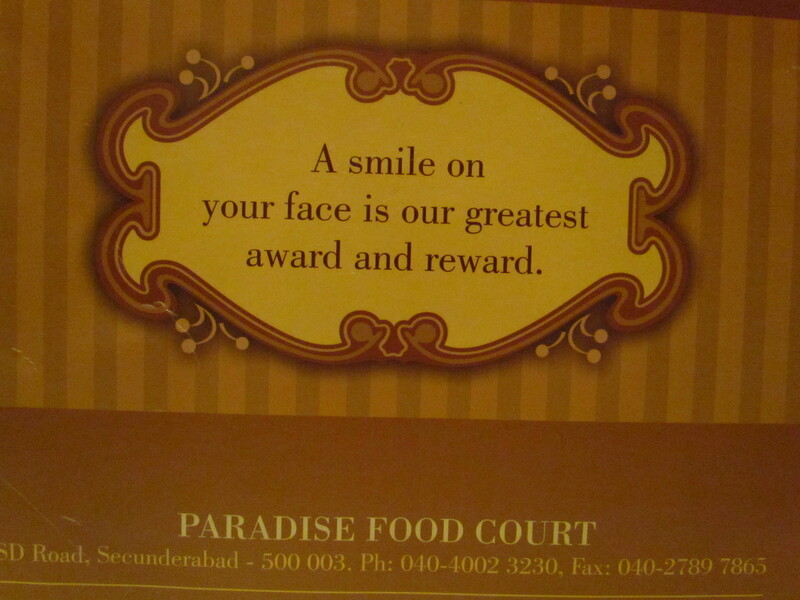 I thought Paradise was a Hyderabadi place but it turned out to be serving North Indian, Mughlai, Chinese, Punjabi etc. Food was surely good in general. Biryani was very good but this was not the best Biryani in Hyderabad. 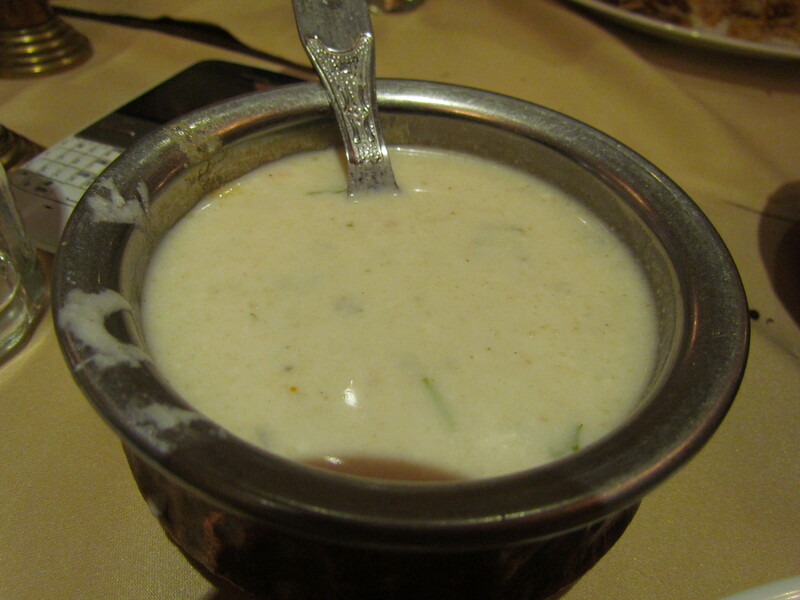 We started our meal with Burrah – on the recommendation of the Host whom I mentioned above. I am ever thankful that we had it. 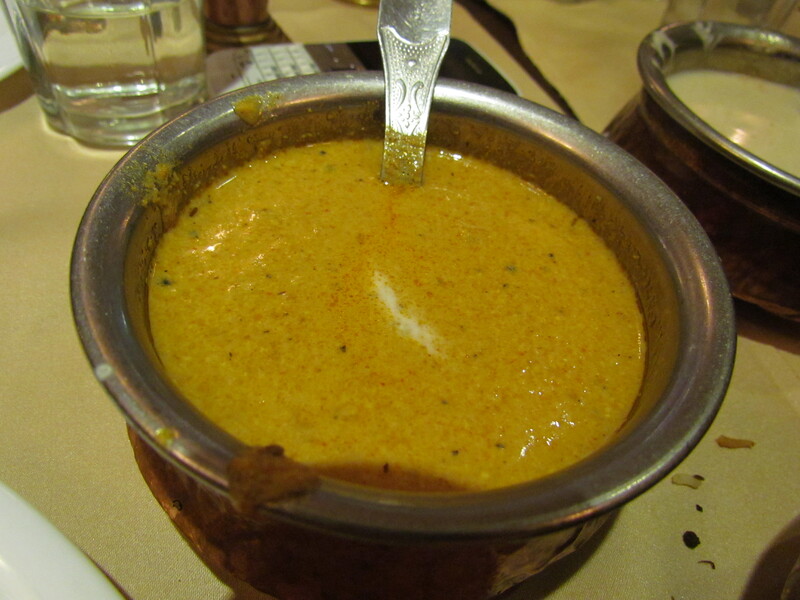 It was better than most of the burrahs I have recently had – Karim’s Delhi, Arsalan Kolkata, Al Kausher Delhi etc. The lamb shank was ‘perfectly overspiced’ & then cooked in a perfect way so that the meat was falling off from the bone with the slightest effort but the meat still retained a good texture. Taste was perfect due to the proportions of the spices & choice of good pieces The meat was optimally charred as well. Loved it & I rate it a straight 4.75/5. 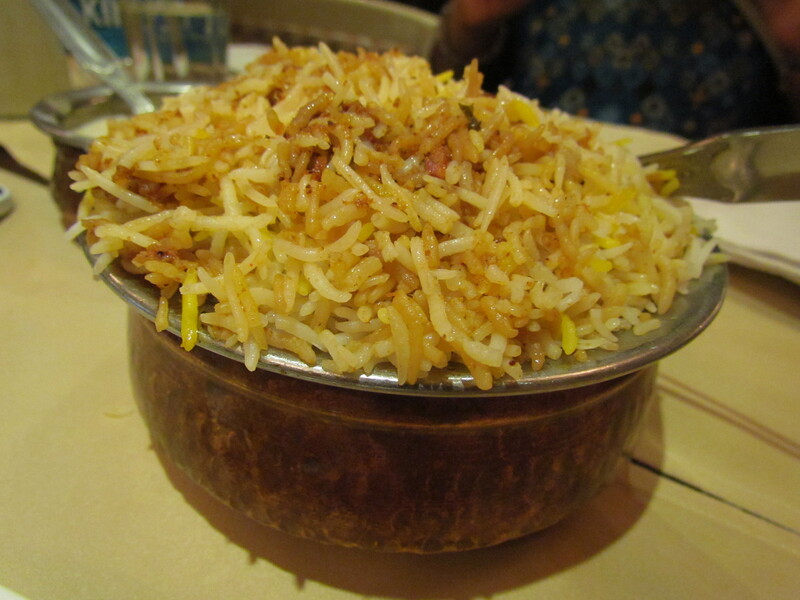 Post this came the Hyderabadi mutton Biryani. This was very good but short of being outstanding. It had long grains of fragrant rice that had independent strands but were not ‘melt in the mouth’ like some of the good Lucknowi Biryanis. The masalas & flavors of meat were all over the rice & just munching on the rice was a very good experience. 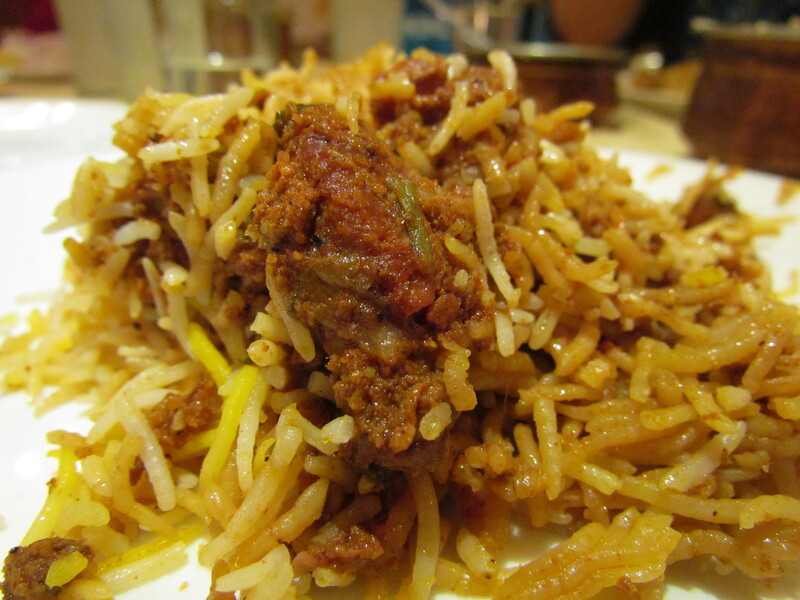 The biryani had a very interesting element of hotness in it – the one which wud come as an aftertaste. 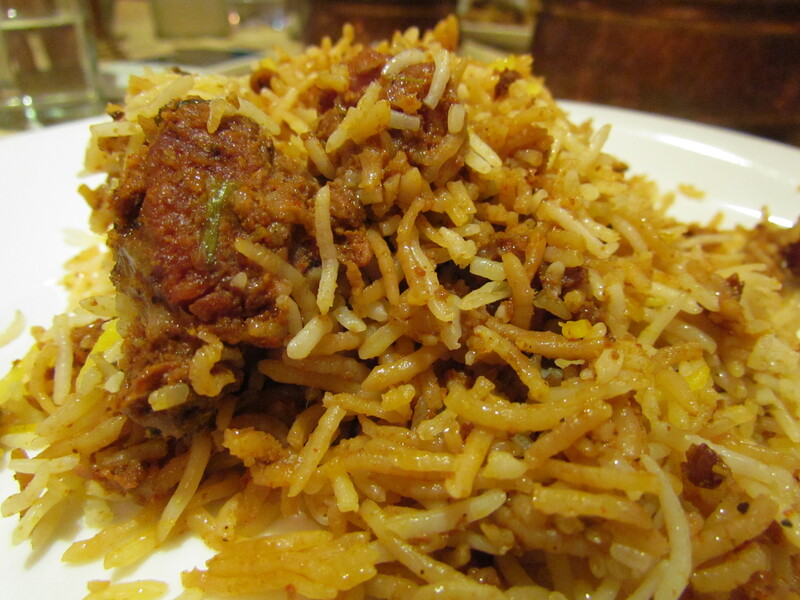 The mutton pieces in the biryani were curried as per Hyderabadi tradition. 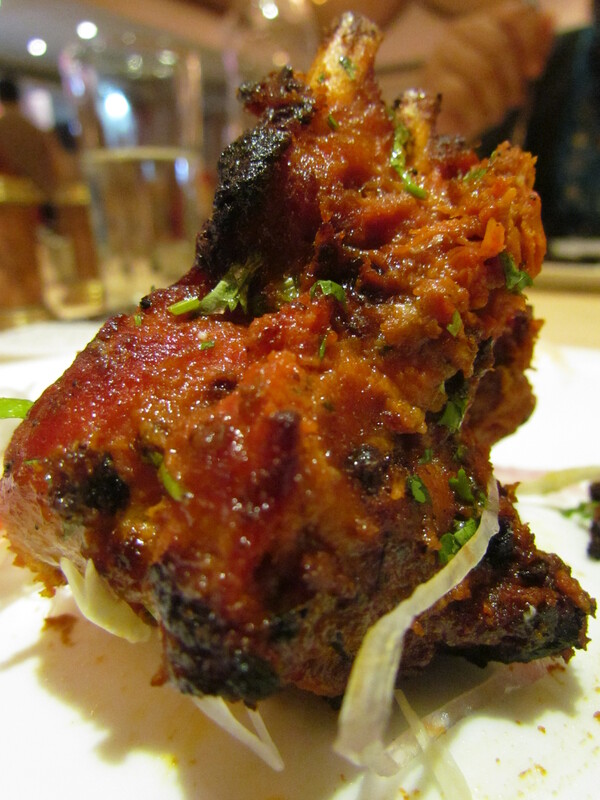 They were YUMM but were not as soft as the meats of Lucknowi Biryani / even the burrah Kabab at this same restaurant. I wud give this biryani a 3.5/5. This came with a salan & a dahi based side. I tasted them separately & liked them. They wud collectively get 3.5/5 as well. I am a purist kind of eater – I prefer eating the food as it is & not with too much sides. Post this we went for Khubani ka meetha. 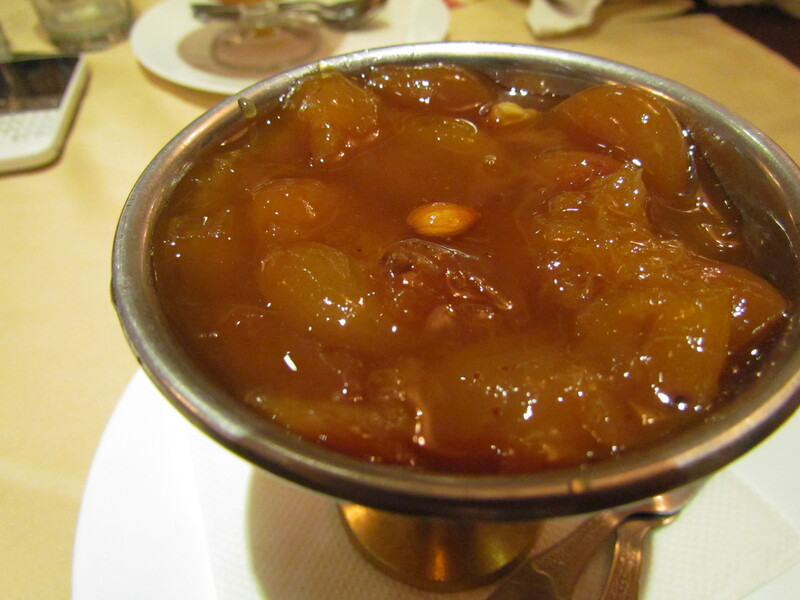 This was a unidirectionally sweet traditional Hryderabadi sweet dish made with Khubani fruit. People give cream / ice cream etc to balance the unidirectional sweetness but that is going out of the traditional way. I give this 4/5. 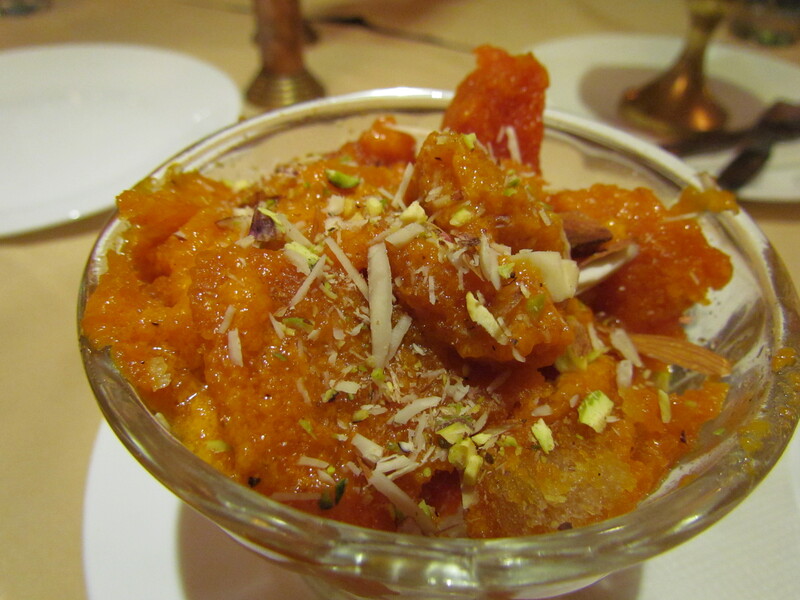 The last dish we had this evening was ‘Double ka meetha’. Weird name, or is it just me? However it tasted quite good. It was deep fried bread pieces dipped in sweetened malai & saffron. The sauce was mildly sweet & dense. The bread had a bit of salt added to it – so the resultant mix was sweet n salt + interesting texture. I wud surely reorder this next time & give this a 4.25/5. I will surely revisit – How about u?